Generally, we’re finding that there are currently two trends with primary school websites. Many primary schools tend to choose either a green-based theme with trees, flowers and maybe an image of their school in the header, or they choose a more corporate approach with high quality photographs and large menu boxes that make navigation easy. Whilst both approaches look great, it is nice when Webanywhere gets to work on something a bit different. Step forward Gordon Primary School, of Eltham, London. The toy-like feel to their homepage is refreshing and fun to use. From the scrolling text that appears in the banner at the top (towed along by an aeroplane – genius!) to the gallery of images that appear on the front of the school building, it’s a website that appeals to children as much as parents and teachers. The menus are clear, too – and clicking through to other areas of the website you can see that the colourful, friendly theme continues. We’d love to see more schools take up this fun, playful, toy-like style of website design – so if you want to refresh your school website, get in touch! 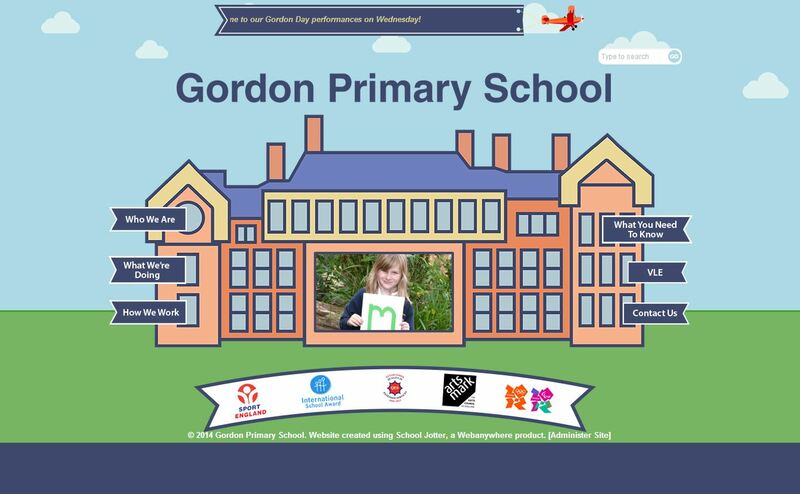 You can see Gordon Primary School’s website here, and you can book a free School Jotter demo here.